It’s time for another Friday of DIY inspiration. It’s also the last one of September; how is the month over already? Before we know it, it will be time to plan NYE and winter projects. But before that happens, let’s focus on all the autumn and Halloween goodness happening lately. And in case you need some crafty ideas (aside from the list of 31 autumn DIY fashion projects I recently posted), here are a few more inspirational pieces to get your mind in full swing for fall. DIY: Tie-dye a white tee with black dye (or a black tee with bleach). Adhere white iron-on letters to spell out “BOO”. DIY: Pearl/rhinestone/metal trim and flat backs + strong glue, like E6000. I’m dying to make these! DIY: This one is SO easy it hurts. Take a strip of black crocheted lace trim and attach a jump ring to one end. Attach a jump ring and a clasp to the other. For less than $1, you’ve got yourself a black lace choker. DIY: With some patience and time, you should be able to find white bottlebrush trees as the weeks roll by. 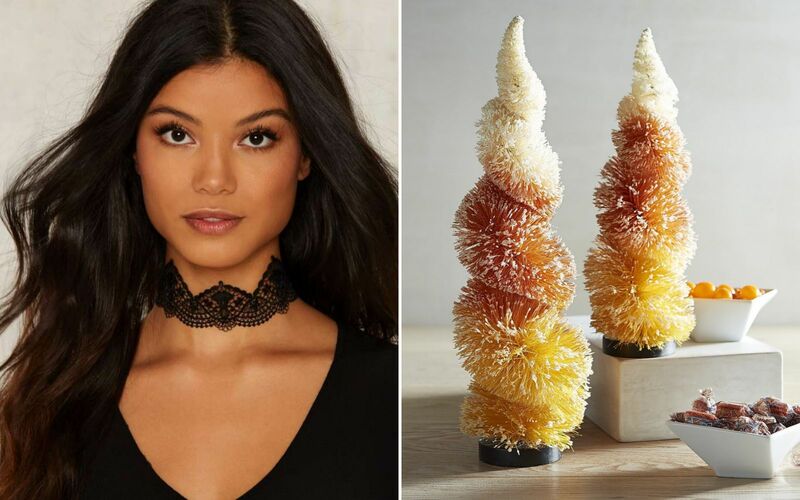 Hopefully, you can get them in time for Halloween to make these charming “candy corn” trees. Simply spray paint the bottom third orange and the middle portion yellow. Want more? Take a peek at my other DIY Inspiration posts for even more ideas.